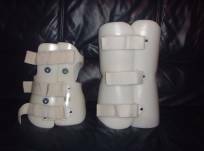 On the left is my first brace from when I was 8 years old, if you look at the back view of the brace you can see three straps these are made from Velcro, and go through the metal loop to the right and are pulled really tight. When I go and see Mike, he checks out how my brace is fitting and how I am doing. When I first got the brace, I had to go a few times to get everything adjusted. The larger Brace is about my fourth brace to be made so this shows you how much I have grown. No, not really. But sometimes I get hot and itchy. I wear a Tee shirt /vest under it to keep it from rubbing against my skin. But sometimes wearing a Tee shirt/vest, my brace, and then regular shirt, it gets hot! Are there activities you are not allowed to do? "Yes" gymnastics, because I twist and turn too much. To wear the brace 20/23 hours a day by 8 to 10 weeks. This will require help from a loved one. 1. Your brace must be put on correctly. 2. Skin must be looked after to stop it from getting red and sore. 3. Your brace must be kept clean. To put the brace on proper really takes two people, the wearer and the helper. Always wear an undershirt under the brace with your underpants going over the brace. 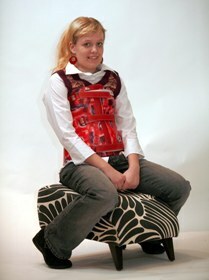 Wearer stands up and your helper stands behind you while holding the brace in their left hand. Your helper then puts the brace in front of the wearer with opening at the back. Your helper then reaches around the wearer and spreads the brace wide enough so that wearer can then step into the brace. Please make sure you have all the straps outside the plastic module. The opening should be in the middle of the back so that the bumps down the spine and the crease between the buttocks are halfway between each edge. Bend your hips and knees by about 45 degrees. The brace will not fit properly if you don’t. The wearer then holds hands on hips and with hands on “hips” of the brace, push down on the brace, so that the sausage-shaped pads on the inside of the brace fit above the hip bone. Very important make sure there are no wrinkles in the undershirt. Wrinkles can cause sores on your body as well as being very uncomfortable. The straps must be pulled tightly as possible by your helper, then the helper threads the straps through the buckles to fasten. The skin under the brace needs to be toughened. The skin can become very red, and raw. Following these steps may help prevent that. Rub surgical spirit to all parts of the skin the brace covers; this will help toughen your skin. Always wear a cotton undershirt (without seams), it’s good idea to turn the shirt inside out so you don’t have the seams pressing on your skin. Never wear brace loosely, this will only cause more skin problems for you by rubbing on the skin. STAGE 1: Try To wear the brace for 6 hours. Apply the brace properly and wear it for around 2 hours. Take it off and check your skin, give your body some skin care by putting the surgical spirit on to your skin. If the skin is pink, put the brace back on for 2 more hours then check the skin again. Do this again for half hour then put on again. If your skin is looking red or sore, the brace must be left off for about an hour and then put on again. If you are still at school like me you can easily do this after school. Do this for the next 2/3 weeks. STAGE 2: Lets try and keep it on for 10 hours. If you have managed stage one then you are ready to move on to next stage. This can be a little difficult to accomplish during a school day so try doing this over the weekend. Start by putting brace on for 4 hours. Then check the skin and give some skin care. Put brace back on and in 2 hours check the skin. Repeat this every 2 hours until you have worn the brace for 10 hours. This stage can last a few days. Move on to stage 3 when you are comfortable to do so. STAGE 3: Wear brace 18/23 hours a day. Now try and wear the brace for school and at lunchtime, take the brace off and check your skin, give some skin care. Put brace back on again. You will need help for this. When you get home take brace off have a bath or shower, give skin care and put clean undershirt on before putting brace back on. This may take many weeks, don’t worry, and take your time. EXERCISES: There are two sets of exercises that you will be given. One will be a set to be done during the hour you are not wearing the brace. These will help your back and stop your muscles from getting weak. The second lot of exercises are those which you do while you are wearing the brace. These should be done as often as you can during the day as it’s these exercises, which will help your brace to be more effective in the treatment for your scoliosis. It is best to wear loose fitting clothes over the brace. Pants usually have to one to two sizes larger. Best to get pants with a elastic waistbands they tend to fit more easily. If you want any advice please contact me, I will be only too happy to help you. I have been in my brace for 6 years now, wearing it for 23 hours a day and I will tell you one thing it keeps you warm in the winter. 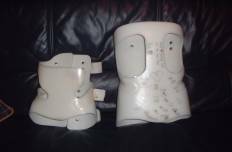 Below are pictures of the brace I wore after surgery, The main difference in this one is that you fasten it at the front, I found it more difficult to bend in this but that could be down to the surgery. This brace is also worn up to six months after surgery depending on your situation. TI am now trying a different back brace, you can see the pictures below.